As eBay looks for ways to keep its customers happy, the auction site is considering offering a loyalty program to reward PayPal users. 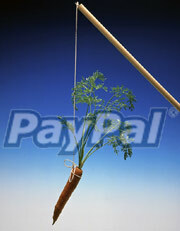 A recent user survey by eBay hinted at the possibility of rewarding PayPal users who spend $3,000 or more a year. PayPal confirmed the idea is on the table. "At a high level, eBay is trying a lot of different things around loyalty," says Sara Gorman, a PayPal spokeswoman. "You'll hear about various programs and offers over the next several months." The loyalty program would reportedly extend to all PayPal purchases, not just those on eBay. The program is still in its planning stages, and is just one of the programs the companies are exploring "to reward loyal customers," Gorman notes. "That said we have no further details to discuss at this time." Reports say possible benefits of the loyalty program may include refund protection, greater buyer protection, coupons/discounts, donation matching, more customer support, lower or no fees, as well as a newsletter and member showcase. eBay may also bring back the eBay Bucks program introduced last year, which gave buyers vouchers toward new eBay purchases based on how much they'd previously spent buying on the site. "eBay believes it's cheaper to retain existing customers than to acquire new customers," says Ina Steiner, editor of Auction Bytes. "In fact, eBay's Board of Directors added the Net Promoter customer-retention program to the eBay Incentive Plan in the second half of 2008." Repeat visitors make better customers than new ones, notes Ali Behnam, a senior digital marketing consultant in San Diego. Indeed, a 5 percent hike in customer retention can mean a 25 percent to 50 percent increase in profits, reports Entrepreneur magazine. "Loyalty programs alone don't create loyal customers, but they can be effective," reports Entrepreneur's Peter Alexander.